Difficulty - Variable - not so easy when you fall and have to get up again. Highlights - Having lunch in the sunshine, clocking up some easy 'on-snow' time. When it comes to skiing David is a wuss. He must have been keen once but it was so many decades ago now I find it hard to remember that David. When we were in our twenties and first married we joined a ski club. 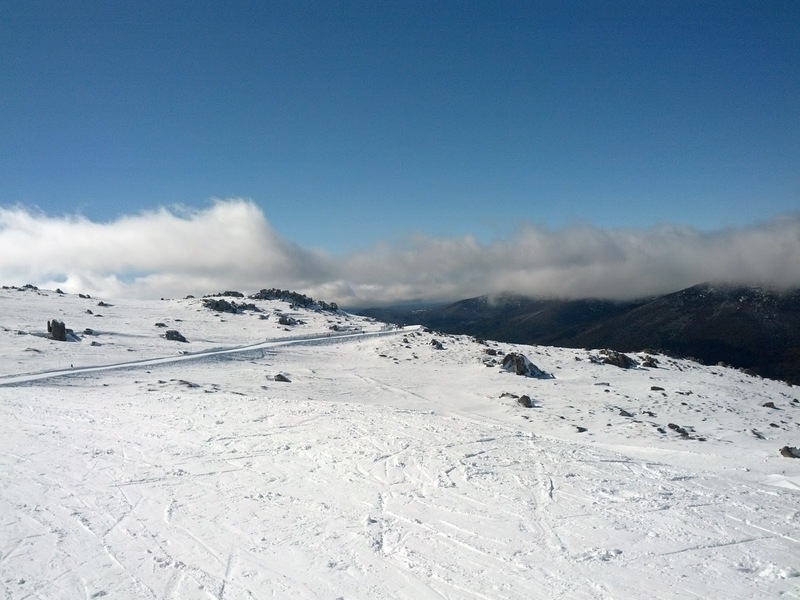 Except for a few years when we lived overseas we have spent a week each year at the club lodge in Thredbo. With two small children ski holidays were a lot of hassle. They were carefully planned and synchronised with friends willing to share the child minding. The small children are now twenty somethings and exact their revenge over all that being minded by being much better skiers than us. I spent all my good years worrying about them, keeping a keen eye on them and dropping them off and picking them up from ski school. I didn't have the energy left to improve my technique. They spent those years learning to ski brilliantly. David still plans meticulously, but nowadays the planning is all about not skiing. It starts weeks in advance with the announcement that - "I don't think I will ski every day. I need to give my muscles a break". This progresses gradually to "I think three days skiing in a week is plenty". As the holiday gets closer the weather becomes a significant factor and the real possibility looms that no actual skiing may be done. Nothing short of perfect conditions will do - no fog, wind, cloud cover, rain, or strangely, actual falling snow. It must be sunny and warm. Not too warm of course. Yesterday was just such a perfect day. Great snow cover, magnificent sunshine. We hit the slopes early. Well early for us - 10ish. One look at the mountain convinced us to take the Snowgums chair. 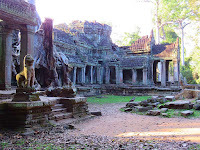 It's old and slow but has the great advantage that it doesn't go the whole way up, stopping short of the most treacherous 50 metres or so at the top. We rationalised this by saying we needed to get out 'ski legs' back. 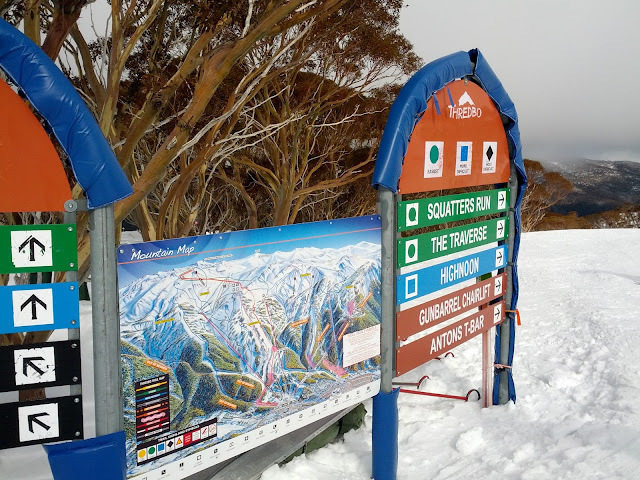 This excuse was wearing pretty thin by mid-afternoon of course but by then there was quite a crowd on the quad chair and practically none on Snowgums. Who wants to stand in a queue for 15 minutes when you can take the slow scenic route to the almost top instead. A couple of successful runs down, success being gauged by getting to the bottom of the mountain without breaking any bones, and we settled in for a nice long lunch at Black Sallees. 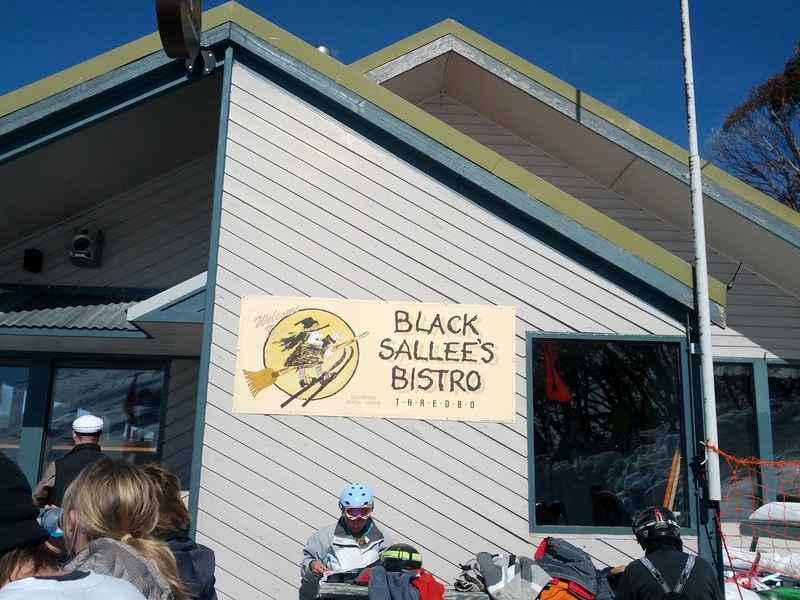 Black Sals is half way up the mountain, right at the top of the Snowgums chair as luck would have it. An hour or so eating and drinking there in the sunshine definitely counts as 'on snow' time. After lunch we felt we had done the hard work of the day and rewarded ourselves by heading across to the easy slopes of the Cruiser. The bottom of the Cruiser chairlift has a great place for hot chocolate. Another well spent half hour before we set out back across the mountain toward home. As I said, David was a keen skier once - but not I think any more. I like to think I am still keen. At the top of the Cruiser chair. Today was another perfect day but David doesn't ski two days in a row. I took courage in hand and skied instead with No. 1 son. David doesn't like t-bars so today was my chance to get my fill of the t-bar runs. Ski the whole day and ski hard. No. 1 son promised not to lead me down any black runs. He didn't, but it turns out he really likes moguls. First run of the day and I think I've broken a rib. I definitely zigged when I should have zagged. I didn't hit the snow that hard and I got up and made it to the bottom without having to call on the ski patrol but I think my skiing for the week is over. As I said, I'm much keener on skiing than David, but maybe he's not such a bad ski buddy after all.